There are few professional golfers on the PGA circuit who fly higher than Phil Mickelson. 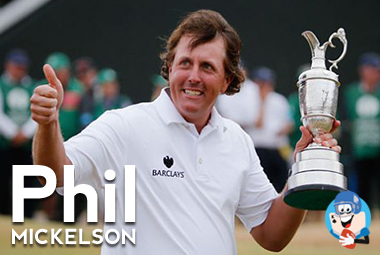 A native of San Diego, CA., Phil learned to play golf from his father, a commercial airline pilot. He graduated from San Diego High School and attended Arizona State University in Tempe, AZ. on a golf scholarship. There he set the collegiate golf world on fire with his sizzling play. Mickelson loves risk. At ASU his daring golf shots won him three NCAA individual championships and many other titles. At age 20, hw won a tournament and decided he wanted to be a professional golfer. Since he turned pro, Phil has won 42 events on the PGA trail, including five major championships, three Masters, and an Open. He possesses a long but occasionally erratic driver. His short iron game and putting are masterful. And he loves to gamble, whether it is on or off the golf course. Once when a group of golfing buddies were gathered around him, they made him a proposition. One bet that he could not put his shoulder against a tree and hit a ball over it. Each of the dozen friends agreed to put up $100 that Michelson couldn't make the shot. He took the wager -- and did it. The ball was still in the air when Michelson bent over to pick up the money. In 2000, he won the Buick Invitational Tournament, endng Tiger Woods' streak of six consecutive tournament victories. After the win, Michelson apologized, saying he didn't want to be the bad guy and adding, "I just wanted to win the tournament." In 2009, his wife, Amy was diagnosed with breast cancer. 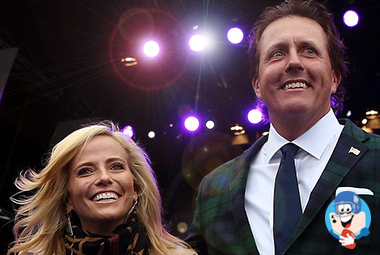 Phil withdrew from tournament play to be with her while she underwent chemotherapy. Two months later, his mother was diagnosed with the same disease. Again, Michelson decided to stop playing golf while he took care of his mother and be with his family. Phil, who is 46 years old, has been a high stakes gambler since 1995 when he began going to Las Vegas. There he bet on baccarat and football games. During the past year he has twice become involved with high profile gambling cases where criminal charges were filed against people he knew. He was not charged criminally in either case, but he did agree to pay a $1 million settlement to the U.S. Securities and Exchange Commission because of alleged insider trading. where he made nearly $950,000. Friends said Phil lost around $2.5 million gambling in Las Vegas. In the summer of 2000 while visiting Las Vegas, he reportedly bet $20,000 that the Baltimore Ravens would win the Super Bowl. They did and Micelson won $540,000 on the wager. P.S. He reportedly shared the bet and the profits with his family and friends. He is also alleged to have moved nearly $3 million to an offshore betting company through a friend who was later criminally indicted for illegal gambling. While that sounds like a lot of money, Forbes estimated the left-handed golfer earns over $50 million a year from playing golf and through lucrative endorsements. My best wishes for continued success go to golf's rocket man who continues to fly higher than most men dream.